AlexNet CNN how can it be applied to my case? I'm working on my last year project where I'm given digitized WSI (Whole Slide Images), though they're fairly small around 1390x1040 size (which is unusual). 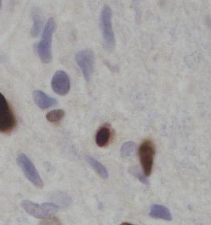 These images are of cases of Glioblastoma Multiforme (brain cancer) which is stained with Ki-64 index, which results in what I assume malignant parts being marked as brown. Here's a small example of what I'm looking at. My objective in simple terms is to count the blue and brown cells (estimation of proliferation indices) which based on what I've researched is a segmentation problem. I've also came to conclusion that AlexNet is a successful architecture for this purpose. However, the trouble I'm having is that this data is unlabeled and as a Comp Sci student, I don't think I have enough expertise to annotate the ground truth values. My question the boils down to this, are there any alternative methods should I explore, or should I drop this dataset altogether? AlexNet (and also VGG, RestNET and other RNNs) are supervised learning approaches, so you need a labelled dataset to proceed. In your case looks like you do not have the labels, so I do not think you can make use of such approaches. You might want to look into unsupervised learning techniques instead. The other option is, of course, to find a labelled dataset which given your task, I would recommend. Not the answer you're looking for? Browse other questions tagged cnn multiclass-classification alex-net or ask your own question. Why does my training loss oscillate while training the final layer of AlexNet with pre-trained weights? How filters are made in a CNN? How does testing a CNN work after training? Can this be a case of multi-class skewness?